The HHM1 digital multimeter/ thermometer is a full function digital multimeter, which also features dual type K thermocouple inputs and voice annunciation of measured values. This compact, portable meter measures true RMS ac voltage and current, as well as resistance and temperature, and will accept any two type K thermocouples terminated with miniature SMP connectors. Whether in the laboratory or on the run in the field, the HHM1 user never has to look at the display to obtain readings. The HHM1 features a standard voice annunciation used to verbally tell the user the current measurement in a choice of five different languages. This unique speech feature will continuously announce measurements, may be operated manually with the push of a button to speak on demand, or may be disabled. The HHM1 displays measured values on an easy-to-read LCD for visual indication, which also includes an indication of the current measurement function, the other available measurement functions, speech function status (continuous, on demand or off), measurement units, thermocouple probe input (T1, T2 or T1-T2), display hold and low battery. All DMM connections plug into the front of the unit. Thermocouples, earphones and the ac adaptor plug into the rear panel of the unit. This rear panel also contains a three position volume selector switch. On top of the HHM1 meter is an on/off switch along with six pushbuttons used to select from a variety of unique additional functions. These include a TEMP function, which selects the thermocouple input T1, T2 or the differential. The OHM ZERO function compensates for the resistance of the test leads for resistance measurements. DISPLAY HOLD/SPEAK selects continuous or on demand speech or freezes the display. The SPEECH button turns the speech function on and off. _F/_C switches the temperature units. AC/DC similarly switches between ac and dc measurements. 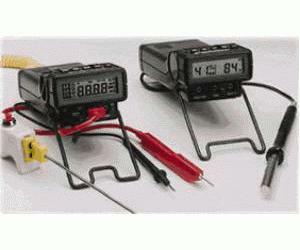 Included with each HHM1 is a set of test leads for measuring voltage, current and resistance. The red lead handle includes a convenient pushbutton to easily operate the speech function while holding the leads. An optional piston grip type K thermocouple handle is also available with a similar pushbutton to activate the voice function remotely for temperature measurements. This handle accepts both standard OST and miniature SMP type thermocouple connectors.